We are remarkable entity, engaged in offering superior range of Chamber Type Shrink Wrapping Machine. Made up using high grade basic material under the guidance of a skilled team of professionals, this machine assures flawlessness. To meet fulfill the wide needs of clients, this machine is available in different customized options for our esteemed clients. 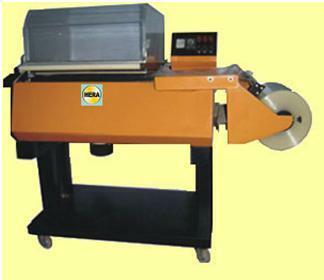 Our valuable clients can avail this machine at very reasonable prices. Established in the year 2010, we, “Harihar Engineering & Roto Art”, are the prominent Manufacturer, Trader, Exporter and Supplier of Rotary Bottle Washing Machine, Automatic Liquid Filling Machine, Sealing Machine, Automatic Sealing Machine, Automatic Labeling Machine, Shrink Wrapping Machine, Applicator Machine, Wrapping Machine, Industrial Machine, Industrial Conveyor, Pouch Packing Machine, etc. These machines are designed by a team of our highly skilled professionals using supreme class raw material with the aid of latest technology in order to ensure supreme quality. The raw material we use in fabrication process is procured from reliable vendors of the market in compliance with international quality standards. The entire collection is widely recognized for their high performance, corrosion resistance, less maintenance, reliability and longer service life. We offer these machines in different technical specifications in order to meet the variegated needs of the clients. Besides, clients can get these products as per their precise requirements through customize specification at market leading price. We have established a huge client base across the nation due to transparency in our trade dealings.